Heritage Baptist Church opened the doors for an afternoon of great food for a great cause at the 6th Annual SOUPer Bowl Lunch for the Light House Shelter on Sunday. This donation-only event, held in the church’s fellowship hall, raised $2100 in two hours. 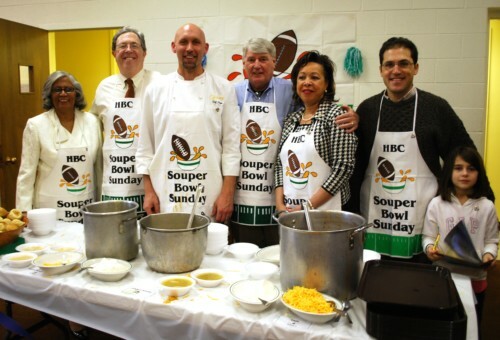 Maryland Speaker of the House Mike Busch, Annapolis Mayor Joshua Cohen, Alderman Fred Paone, and Alderwomen Shelia Finlayson and Classie Hoyle ran the soup line, ladling bowls of chili, chicken noodle and baked potato soup for the crowd. The soups, along with yeast rolls and salad, were prepared by Chef Zachary Pope of Roundz Gourmet Market & Catering in Gambrills. Members of the Heritage Baptist Youth Group waited tables and assisted diners. Heritage Baptist is a member of the Annapolis Area Ministries which supports the Light House Shelter.